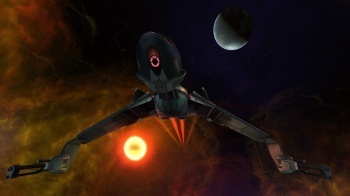 Cryptic Studios has revealed that Star Trek Online won't be coming to consoles after all. Cryptic said that Star Trek Online was being developed for both PCs and consoles when it announced that it had taken over the project back in mid-2008. That plan has apparently fallen through, however, as Executive Producer Craig Zinkievich told VideoGamer.com that the game is "pretty much in the same boat as the Champions [Online] console version right now." "It's something we can readily do in terms of technology," he said. "We've had it up and running on certain consoles, and had plans and designs in order to take advantage of those platforms. But as it stands right now it's a little difficult to make that final leap on the business side of things. So, currently, just like Champions, the console version of Star Trek Online is on the back burner." Like STO, Champions Online was originally intended for both PCs and consoles and Cryptic COO Jack Emmert claimed in September 2009 that the studio had an Xbox 360 version that was "ready to go" but was being hung up by foot-dragging at Microsoft. Last month, however, Cryptic confirmed that the console version had been shelved so it could focus on "making the current PC product the best it can be."